Having learned to read and write Tibetan by himself when he was young, Chodrak Monastery invited Vajra-Vidya Lama Karma Rabten Rinpoche to become a monk. There he studied medicine and astrology (among other subjects) before becoming a meditation adept through his completion of the Three Year and Three Month Retreat with single-pointed concentration. He was then enthroned the Vajra Master of his own monastery. Later, he completed another three year retreat at the Gyalwa Gyatso (Jinasagara) Retreat Centre, followed by a one year retreat at the Bamchungma Retreat Centre. He spent two years (practising) in his monastery's retreat hall, and then took a vow to spend nine years in retreat. During this extended retreat he attained three (of the four) practices of approach and accomplishment (Nyen Drup). 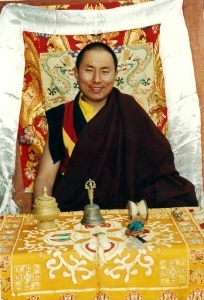 He has studied the central pillars of the Barom Kagyu tradition with Kyabje Selje Rinpoche, Drupnyi Yeshe Rabje, Tshangsel Lodro Rinchen Rinpoche and others. In receiving instructions from these spiritual friends who were both scholars and adepts, he was granted profound guidance through many texts, and given numerous oral transmissions and empowerments. He received many oral transmissions of, and instructions on, the Kangyur, the collected works of Mipham Rinpoche, Jamyang Khenytse Rinpoche and Jamgon Kongtrul Rinpoche. When the main teacher of his monastery, Tendag Dungdrul Rinpoche, was reborn, he was chosen to enthrone him. He has been asked by many people to advise on how to find compatibility between the religious and secular elements of life. In order to help bring peace to the earth, he has attentively taught men and women what they should start doing and what they should stop doing. In other words, he has taught them about Karma, cause and effect, how to abandon wrongdoing and how to practise virtue. He has also been engaged in attempts to relieve the suffering of those beset by a variety of the causal body's illnesses by making sure they get free medicine. He wants to help these ill people by providing both the medicine they need and conducive conditions for their recovery. To do this he is asking for help from anyone who wishes to sponsor these activities. Any funds that are donated to him will be used to buy medicine for the ill people who cannot afford it. As well as using the funds to buy medicine, Rinpoche will also perform more than 100 million recitations of Chenresig's mantra, release 100 thousand animals and recite Vajrasattwa mantras, or whatever practices are requested by those who agree to help provide this medicine. He is particularly in need of funds to buy medicine for those suffering from leprosy and epilepsy. If you can help, please forward to him your address and contact details. Those who help will be forming a bond with this beneficial activity and prayers will be made repeatedly to the three jewels and sources that their individual dharma activities are effective.